Sixteen-year-old Jeff Jacobson had never heard of Jeffrey Dahmer, the infamous serial killer who brutally murderered seventeen people more than twenty years ago. But then Jeff discovers he was constructed in a laboratory only eight years ago, part of a top-secret government cloning experiment called Project CAIN. And scientists created him entirely from Jeffrey Dahmer’s DNA. Jeff isn’t the only teenage serial-killer clone. Others have been genetically engineered using the DNA of the Son of Sam, the Boston Strangler, and Ted Bundy. Some clones were raised, like Jeff, in caring family environments; others within homes that mimicked the horrific early lives of the serial killers they were created from. When the most dangerous of the boys are set free, the summer of killing begins. Worse, they hold a secret weapon even more deadly than the terrible evil they carry within. 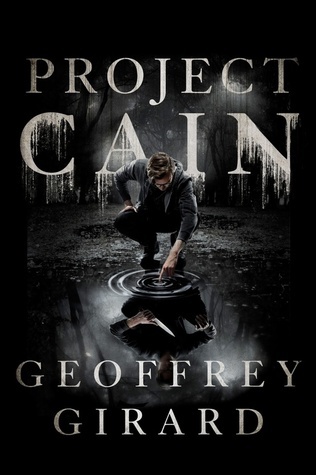 Project Cain is a companion novel to Cain’s Blood (my review), one of the darkest and gripping thrillers I’ve read to date. The companion novel concept is interesting in that Cain’s Blood is an adult thriller, but Project Cain is intended to be 16-year-old Jeff Jacobsen’s (Jeffrey Dahmer clone) journalized version of events, and is considered YA. They could be stand alones, but I’d strongly recommend reading Cain’s Blood first. Much of this story is based on the duel between nature versus nurture, and this is a question young Jeff ponders throughout the story, all the while knowing who and what he is. His internal struggle is heartbreaking at times, as he wrestles with what he knows to be right and the monster others expect him to be. He even questions his own sanity, and it’s a mighty heavy load for a 16-year-old to bear. The reader may even be conflicted about their own feelings toward Jeff, knowing who he is – which makes it an even better read. This book has received several negative reviews in regards to the lack of dialogue and quotation marks, and telling instead of showing. The author states at the end of the book that “Project Cain is meant as a journal written by Jeff Jacobson a couple of months after the incidents of the story, and I simply don’t believe he’d use quotation marks in such a journal.” I completely agree. Do you use quotation marks when journaling? I don’t, and seriously doubt a 16-year-old boy would either. Project Cain made me question my beliefs about nature vs. nurture. It explores the inner workings of the mind of a sociopath, shows how he perceives the world, and tells the story of a teenage boy’s struggle to figure out who and what he is. A compelling concept and an enthralling read. This sounds…disturbing. But intriguing. I was wondering if they were being purely evil, raising a new race of cloned killers, or testing nature versus nurture. You answered that. Seems very dark yet has a fascinating premise. It’s a disturbing premise, but absolutely fascinating. After reading the description of Cain’s Blood, I needed to read that book immediately. Reading Project Cain from Jeff’s perspective was both gripping and sad. You should try it, Sarah! This one sounds very different….highly unique! But what a story it is! MIght be hard to stomach for some, but definitely worth a read. Thanks for the RB, Don!